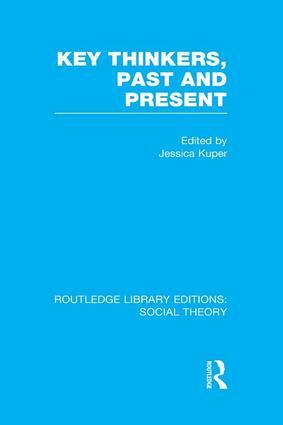 This volume provides a fascinating perspective on the social sciences through its examination of the leading proponents, their ideas and careers. It includes useful suggestions for further reading. All the great names in the history of the subject are here – Freud, Marx, Weber, Adam Smith and so on – along with many less prominent but nevertheless important thinkers. Adler. Althusser. Arendt. Aristotle. Aron. Arrow. Barthes. Bateson. Bentham. Blau. Bloch. Boas. Bowlby. Braudel. Bruner. Burke. Chomsky. Comte. Cournot. Dewey. Durkheim. Elias. Engels. Evans-Pritchard. Eysenck. Feyerabend. Foucault. Frazer. Freud, A. Freud, S. Friedman. Goffman. Gouldner. Gramsci. Habermas. Hayek. Hegel. Hobbes. Hull. Hume. Illich. Jakobson. James. Jung. Keynes. Klein. Kropotkin. Kuhn. Lacan. Laing. Leontief. Le Play. Levi-Strauss. Levy-Bruhl. Locke. Lukacs. Luria. Machiavelli. Malthus. Mannheim. Marcuse. Marshall. Marx. Mauss. McLuhan. Mead, G. Mead, M. Merton. Michels. Mill. Montaigne. Montesquieu. Morgan. Mosca. Myrdal. Pareto. Park. Parsons. Pavlov. Peirce. Piaget. Plato. Popper. Radcliffe-Brown. Ricardo. Rogers. Rostow. Rousseau. St Simon. Sartre. Saussure. Schumpeter. Simmel. Simon. Skinner. Smith. Sombart. Sorel. Sorokin. Spencer. Sullivan. Tawney. Tocqueville. Tonnies. Tylor. Van Gennep. Veblen. Watson. Weber. Wittgenstein.